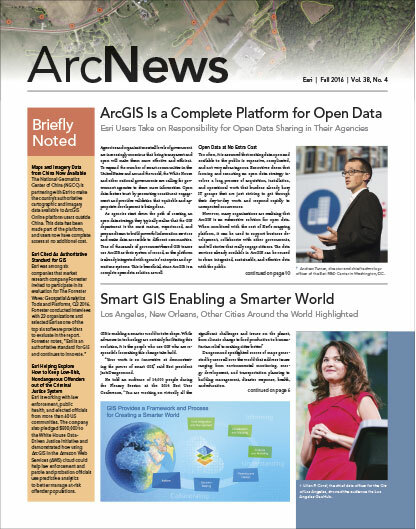 The September release of ArcGIS Online includes more content and enhanced apps and continues efforts to enrich Esri’s commitment to open data standards. Although ArcGIS Online already hosts the most extensive digital collection of geographic content, Esri keeps incorporating more. ArcGIS Online now includes Cyprus as a preferred region, so anyone can make it the default extent for new maps. For vector basemaps (which is still in beta), Esri updated several regions of the world and augmented some of the basemaps’ capabilities, such as their display in high resolution and the ability to customize map styles, including labels. Esri continues to amplify its support for Open Geospatial Consortium, Inc. (OGC), services by upholding standards and working toward increased interoperability. The map viewer in ArcGIS Online now contains additional options for appending custom parameters to OGC Web Map Service (WMS) layers, OGC Web Map Tile Service (WMTS), and OGC Web Feature Service (WFS) requests. Additionally, when adding WMS data to a map using the map viewer, users can choose which layers they want to add instead of adding the entire WMS service. The September release of ArcGIS Online brought many improvements to ArcGIS apps as well. Users of Web AppBuilder for ArcGIS can now edit related records, conduct local searches, turn filters off on a map, and extrude polygons in 3D. Collector for ArcGIS now supports high-accuracy GPS receivers and allows users to attach PDF and Microsoft Word documents. Workforce for ArcGIS users can easily launch Collector and Survey123 for ArcGIS from their assignments, and both Collector and Survey123 now preserve the Exif metadata associated with device-captured photos. Survey123 has more than 20 new mathematical functions for user input validation rules, and the app’s reporting capabilities have been enhanced with added support for PDF exports. Creating surveys in a web browser is now easier too. To learn about more updates included in the September release, visit the ArcGIS Online What’s New page and check out the ArcGIS Online blog.